Charming rose-pink, heart shaped flowers dangle enticingly from elegant arching stems, giving this plant its common name of Bleeding Heart. This beautiful spring flowering perennial is one of the earliest to bloom each year, often continuing into early summer. The finely-cut foliage forms attractive clumps that increase year after year, at a slow but steady rate. This graceful hardy perennial enjoys a reliably moist soil, making it ideal for damp woodland areas as well as cottage garden borders. Categories: A-D, Featured Plants, Plants A-Z, Plants by Season, Plants In Situ, Spring, The Cottage Garden, The Spinney Walk. 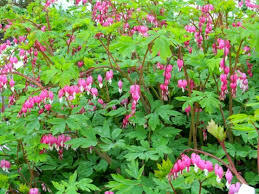 One of the most popular of old-fashioned garden plants, Bleedinghearts burst into flower in late spring. Plants form a bushy, upright mound of light green foliage, with a somewhat ferny appearance. Dangling bright-pink locket flowers are held on arching stems, and these are excellent for cutting. Performs best in a rich, moist soil with partial shade, or at least protection from hot afternoon sun. After flowering, the plants should be sheared back to 6 inches tall, to rejuvenate the foliage. Even still, these often go completely dormant by midsummer, to return again the following spring.